Of course - you don't go for karting to Mombasa. But if you are once there - why not? ... and if your kids will discover it, you end up spending the half holiday on this thrilling place. A Go-Kart track with African charme. You drive under palm trees, and on which other Go-Kart track will you find camels and donkeys and turtles? But beside the African touch, the place is on top standard with well maintained and fast Swiss Hutless Go-Karts and a state of the art timing system. For kids, the karts have remote controlled speed governors, so that the speed can be electronically reduced. Beside Karting, there is also an off-road track with beach buggies. The kids have to be at least 14 years to drive them. For younger kids is the excavator park, with real excavators to dig in a huge sand heap and with some challenges and competitions. 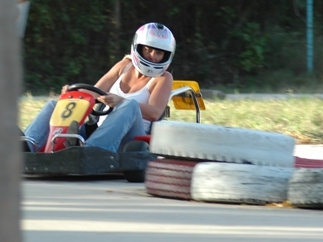 Mombasa Go-Kart is located next to the Severin Sea Lodge Hotel and open from 4pm - 10pm Tuesday - Sunday. The center has a large sports screen where you can watch football , Rugby and any other major sporting event. There is a viewing veranda located in the bar and you can order food from the bar whilst you are having a drink and watch the action on the race track.